Since relief shading is a very demanding task, cartographers need some basic knowledge in order to achieve satisfactory results. This section presents the rules and guidelines that exist for relief shading. Every cartographer and attentive map reader will agree that the example on the right is a much “nicer” depiction of the terrain than the one on the left. “Nicer” means, the map reader can identify the large landforms at first sight and still easily discern important small details. Applying the aforementioned rules yielded the image on the left, while the one on the right is an analytical relief shading with a fixed illumination. The relief shading has to depict the form of the terrain in a descriptive and easily sizeable manner. This is the most important rule. 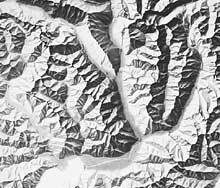 Before a cartographer can start designing a shaded relief, he has to compile the necessary basic data. 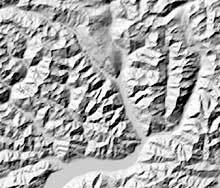 This includes contour lines, river networks, aerial photographs, pre-existing maps and other information describing the form and appearance of the terrain. The river network and the contour lines serve as a framework for the following steps and must be visible during the whole shading process. Which Shadows Should One Depict? 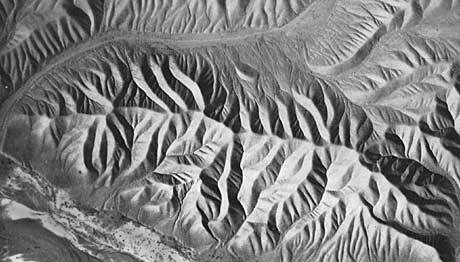 A shaded relief depicts the brightness of a terrain’s surface under oblique illumination. Three-dimensional shadow effects very similar to a shaded relief are observable in nature, if the landscape is uniformly coloured. Three-dimensional shadow effect in nature (Iraq). By not representing cast shadows, reflected light and glittering highlights, cartographic relief shading becomes simpler to read. Although these phenomena are observable in nature, they may lead to wrong interpretations of the final cartographic product.